We are a leading Manufacturer of vintage watering can, garden watering can, copper watering can and antique watering can from Moradabad, India. We are listed at the apex to manufacture and export best quality Vintage Watering Can that is known for the quality we offer. Durable in its characteristics, it is widely considered among the prestigious clients, we have garnered so far. Driven by a client-centric approach, we check the whole range of cans offered on various parameters and hence assure to deliver a defect-free range of products. 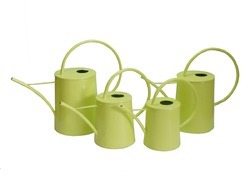 To meet the rising demands of our customers, we bring forth high quality Garden Watering Can that is manufactured in accordance with the prevailing market trends. Resistant to corrosion, it is widely acknowledged among our valued patrons. Committed to cater to the different requirements of our clients at prime, we make the whole range of watering cans offered by us available in various sizes. 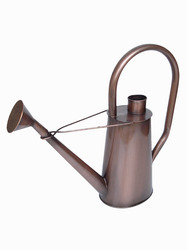 We are one among the prominent manufacturer and exporter of a high quality Copper Watering Can that is made using the premium quality copper sourced from the market leading vendors. Known for their elegant designs and fine finish, these are widely acknowledged in the market. 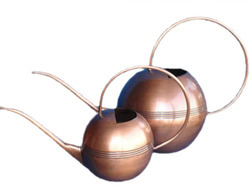 The range of copper watering cans offered by us is highly demanded for its long lasting life and superior finish. 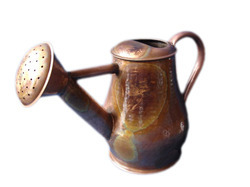 We are engrossed in the manufacturing and exporting of optimum quality Antique Watering Can that is widely considered for its attractive design. Known for its perfect finish, it is highly regarded in the market. Owing to its durability and anti-corrosive properties, the offered range of antique watering cans is highly acclaimed among the clients, we have accomplished to reap so far.